How do you fight worry and stress? Do you eat? Do you go for a run? Drink coffee? All of the above? Worry is apart of our life and we need to find ways to combat it.99 Ways to Fight Worry and Stress by Elsa Kok Colopy is a sweet little book (only 100 pages!) with some practical advice on how to handle worry and stress. I appreciate that you can pick up and look at this book and not have to invest a lot of brain power! (I mean that in the best way.. for those of us with a lot of worry and stress, we can't seem to afford to give much of our brain power away can we? lol) I like that you can choose what you want to take from it, as well as pick and choose which # you want to read about. It makes great for strategic placement in the bathroom when certain guests that could use a little help come over. *wink wink*.Colopy provides short story segments, biblical wisdom, and practical down to earth ways to deal with stress. If you're looking for ways to enjoy your life and create some peace regardless of what's going on around you, this is a great book to check out! Are you going through a tough situation in your life right now that you just feel so tired and stressed? 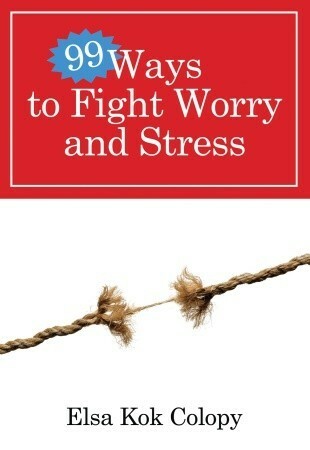 Well, this book can help you how to deal with them. With over 99 practical tips that you can do and apply in your day to day life.